Solomon Quest novel by author Andrew Whitehead, scuba diving maritime mystery adventure book Japanese submarine. Andrew Whitehead's maritime mystery adventure, SOLOMON QUEST, is currently available. ISBN 1-905226-65-9 Melrose Books, Ely, UK, 336 pages, softcover. Underwater adventurer Jim Lawrie is lured to the Solomon Islands by an offer to explore a newly discovered wreck. Diving from the M.V. Solomon Explorer, Jim identifies the wreck as a Japanese submarine from World War II. Rumours of smuggled treasure are a regular occurrence in the Solomons, and a story quickly spreads that the wreck contains a large shipment of gold. The beautiful, feisty and independent Rene Armstrong is also on board ship for a diving holiday to escape from a broken engagement. Jim and Rene soon join forces to explore the deep, mysterious wreck, ward off the Japanese dive team who are keen to recover the gold, and the deadly local gangsters eager to steal the bullion for themselves. Jim’s quest takes him to the very limits of normal scuba diving and into life-threatening danger above and below the water as he struggles to uncover a secret that has rested on the sea floor since the 1940s. 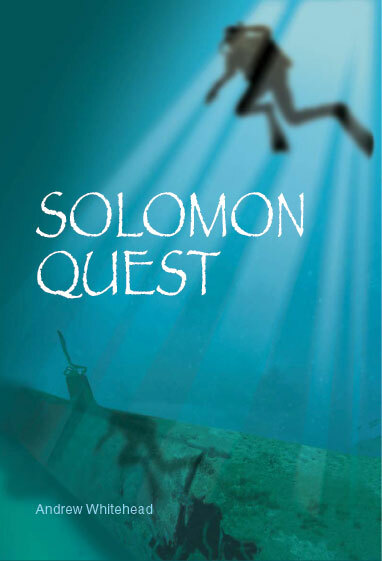 Buy an autographed copy of SOLOMON QUEST as a special gift. Individually autographed copies are available from the author. AUS $20 postage free within Australia. Email the author to arrange payment and delivery. PayPal accepted. ‘A good yarn and the author has obviously done his homework.’ Keith Hetherington, author. ‘A well-written and carefully crafted story.’ Austin Kehoe, Commissioning Editor, Melrose Books. 'This book will appeal to all divers and non divers alike who love a mystery and a good adventure yarn. All in all it is an enjoyable, interesting and easy read.' Kevin Denlay. ‘Solomon Quest is a gripping read, providing an insight into the world of scuba diving told with an exciting adventure. The strategy of the story gathering pace as it went along ensured that this reviewer found herself reading faster and faster to the end.’ Veronica McLean. Research by the author in writing Solomon Quest.